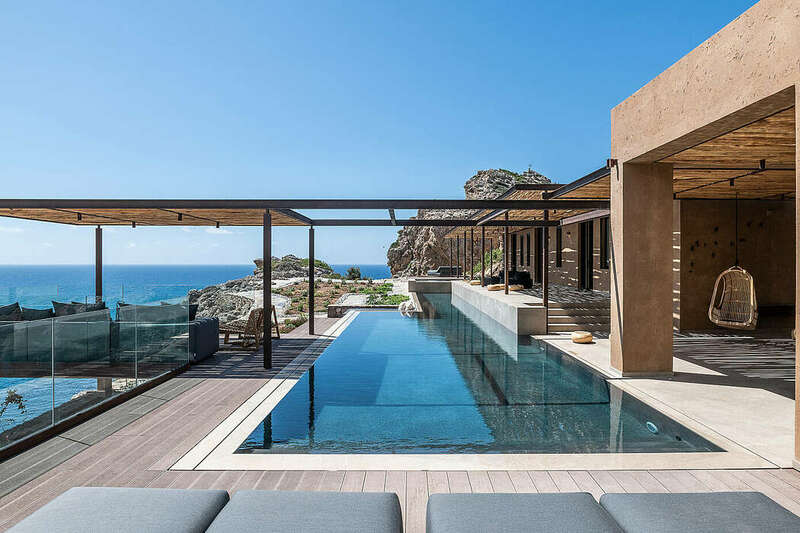 Leaning on the rock of the mountain almost at the top of Cape Koutoulos, integrated to the wild landscape and made of earthy materials, this elongated residence protected from the northern wind, overlooks the Western Cretan Sea towards the South. A robust L-shaped wall made of stone serves as a continuation of the mountain and defines the arrangement of all the indoor spaces. Two clean volumes, one consisting of the living room, kitchen and dining room and the other consisting of the bedroom suites, are interconnected through a long semi-open living area, starting from the rock and ending on an elevated platform floating between the mountain and the sea, the sky and the earth. Situated in Stinson Beach, California, this beautiful beach house was designed by Lauren Nelson Design. Recently completed by Lambs & Lions, this beautiful boutique hotel is located on the Greek island of Kos. This beautiful beach house situated in Newport Beach, California, was designed by Patterson Custom Homes. Designed by Paul Brough, this inspiring beach house is situated in Sydney, Australia. This beautiful ocean-front residence located in Dana Point, California, was designed in 2018 by Carl Akins Company. This inspiring beach residence located in Newport Beach, California, was designed in 2017 by Carl Akins Company. Located close to the Mediterranean sea, in Aix-en-Provence, France, this beautiful retreat was designed in 2018 by Refuge. Designed by Hoedemaker Pfeiffer, this three-story lake house is located on the lake Chelan, Washington, United States.